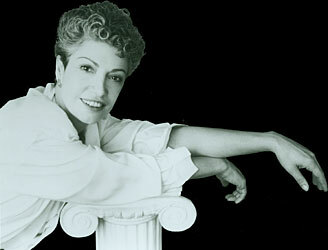 Joelle Wallach’s 1998 work, A Revisitation of Myth is a four-movement chamber piece for viola, piano and medium voice. 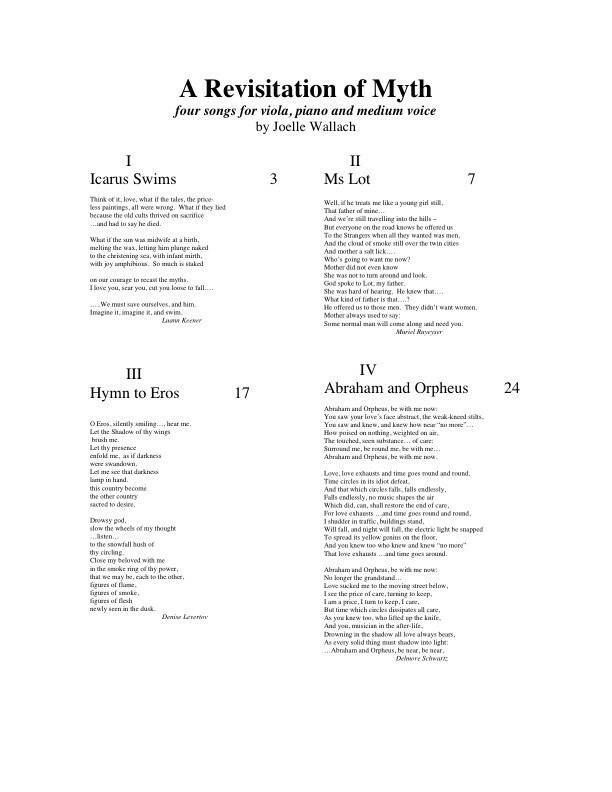 Each of the four lyrical and moving songs re-examines a myth (or myths as in the fourth one) to discover new, different or more complex meanings in it. 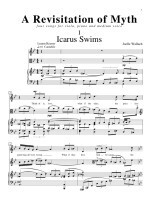 The first song, Icarus Swims, is an invitation to regard Icarus’ fall from sky to ocean in a new way. The traditional interpretation views Icarus’ immersion as punishment by the sun and the gods who melt his wax wings for his hubris in attempting to fly. Instead, this song suggests Icarus’ plunge might be seen as a baptism, an entry into a new domain, born of his adventurousness and daring. 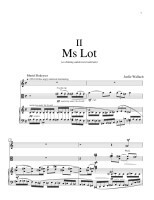 Lot’s Biblical daughter, Ms Lot, sings the eponymous second movement. She doesn’t think her father is such a great guy, whatever God thinks of him. She thinks her father betrayed her as well as her mother and her sisters; and she’s worried about what man would possibly want her now. She’s frantic and whine-y and self-centered. She probably gets it from the father she describes so resentfully. Angry in the manner of rebellious teenagers, she’s panicked, too, adjusting to a new life suddenly devoid of all that’s comforting and familiar—mother, home, the expected future. Throughout the song, a relentless, repetitive, murmuring figure passes back and forth among the musicians. 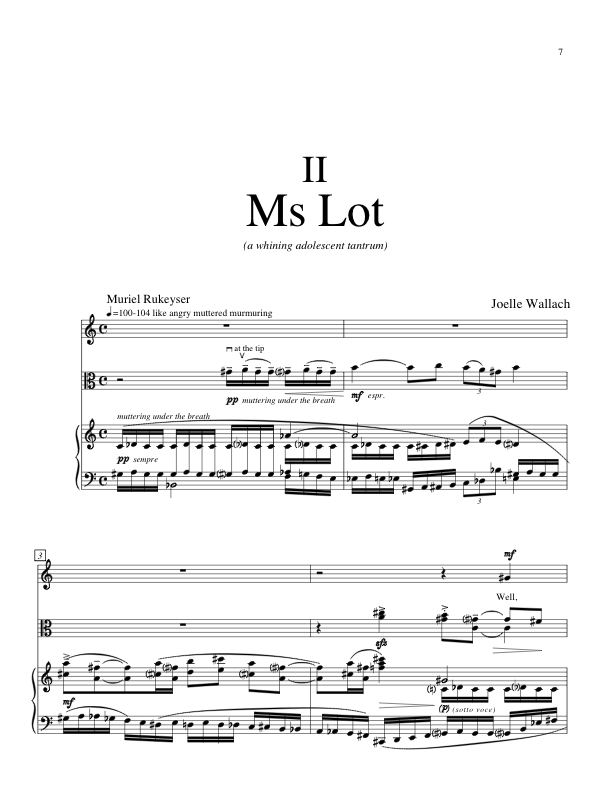 While the principal melodies soar and roar, and the song speeds up and slows down, the muttering figure binds everyone together and encapsulates the protagonist’s hysteria. 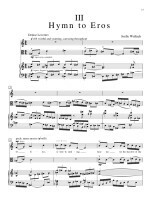 The third song, Hymn to Eros, is simply a plea, a sinuous, sensuous strenuous, wish. 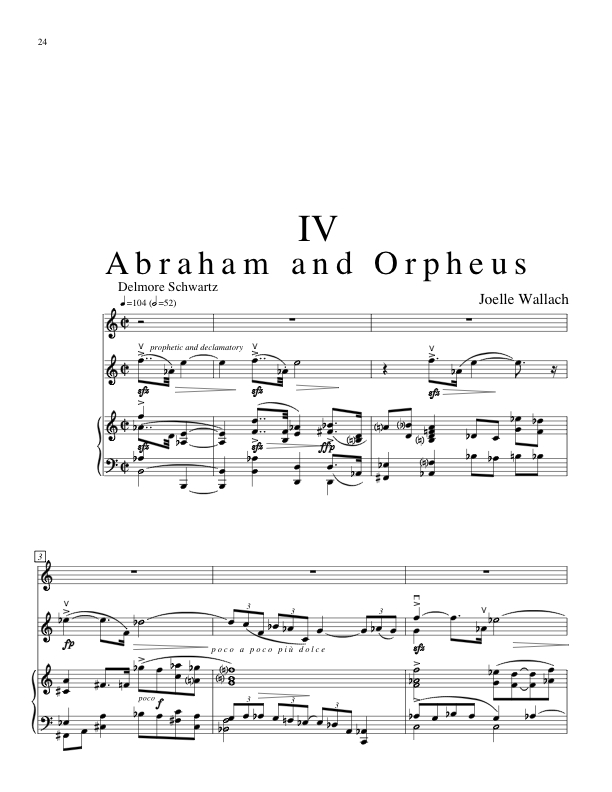 The final song, Abraham and Orpheus, exhorts the two mythic heroes, pleads for their wisdom, and compares their perplexingly opposite lessons. 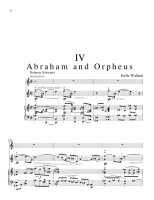 Abraham complied with an order to sacrifice his beloved child as a token of his faithfulness to a mysterious divinity, while Orpheus could not prevent himself from turning to look at his love. He lost her in his all too understandable disobedience. Orpheus’ conviction that the resonance of his song could prevail even over death was shattered by the painful power of human love itself. The calling motive with which the viola and piano introduce the song is repeated and modified as the song continues. 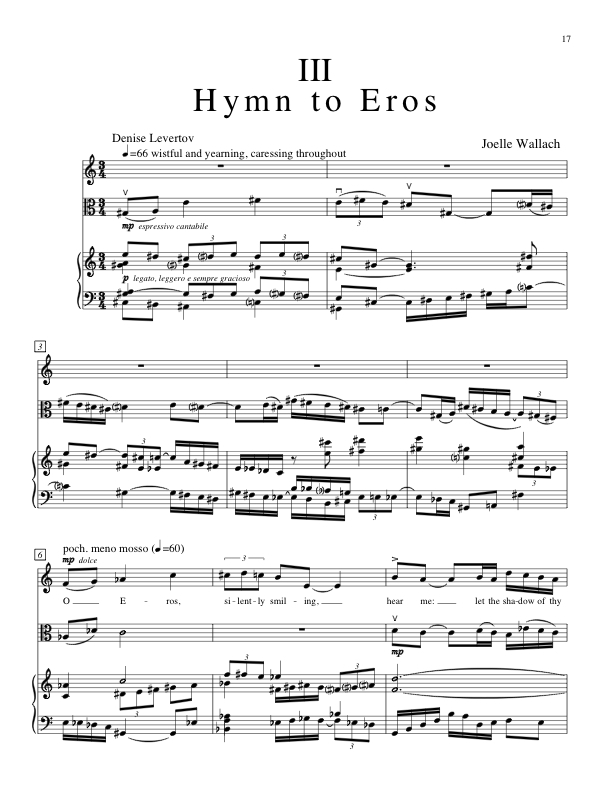 It evokes a variety of other voices: the calling of Abraham the father and Isaac the son, the tragic calls of Orpheus and Euridice, the singer’s own exhortation, and the traditional call of a ram’s horn, a heritage of these same spiritual struggles. 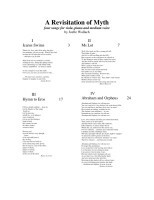 The myriad, shifting suggestions implied in the musical “calling” figure reflect the more global unfolding and elaboration of myth and meaning themselves.